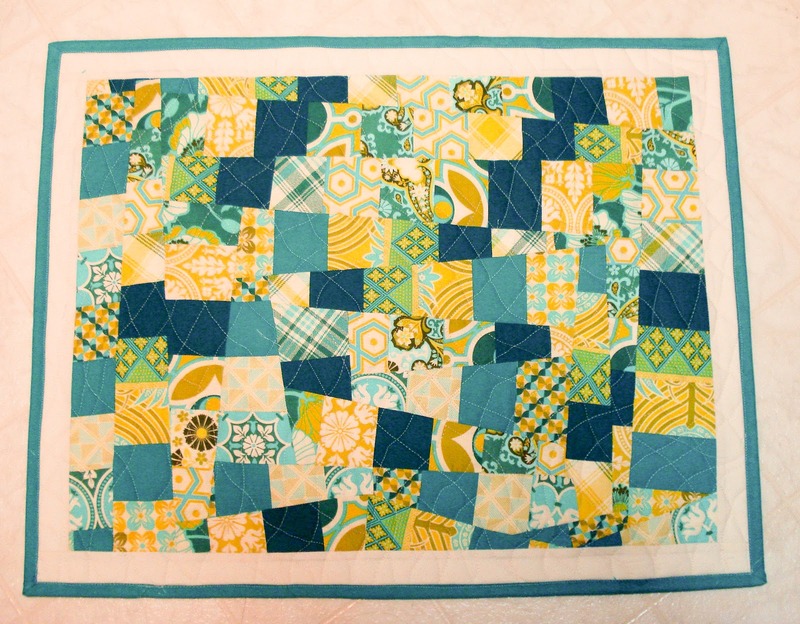 Kristin's Quilts and Stuff: New Fabric, New Project! I just got a package in the mail this week from Intrepid Threads, Notting Hill by Joel Dewberry. It is a bit yellower/greener than I expected so I ran over to New Moon Textiles and picked up some Kona solids in teals and cream. Gonna try some improv piecing/ cutting and see what I come up with. The finished projects need to be a table runner, kitchen rug and a plastic bag dispenser. Included is my inspiration links.....My actual mat does not look like any of my inspiration...? Oh well, I'm happy with the results. I used the Matrix FMQing from Leah Day. Made strip sets and randomly cut them up and sewed back together. 2 layers of fusible felt and 2 layers of fusible batting with canvas as the backing. I steam pressed this very flat and then quilted it. My immediate reaction was that I LOVE the wonky strips. I like it enough that my brain is already trying to figure out how I can do that too. Those of us who have been quilting for a while have spent so much time and energy on getting points and corners and seams exactly right that the freedom of doing things wonky is very liberating. Thanks, Stella. I love the freedom of the cutting and sewing it back randomly. No pattern, no points and no pressure. I have struggled with perfect points and meeting corners, I think that is why I am drawn to appliqué! I love your scrappy improv even better than your inspiration. Nice finish! I love your improv piece!